Thoroughly flour the chicken in the flour mixture. Brown chicken in butter and olive oil. Remove from pan and set aside. Add the 2 tablespoons flour and stir together . Add the chicken broth and stir scraping all the yummy bits of flavor off the bottom of pan. Replace chicken into pan with onions and broth. Drain artichokes and add to pan. Cover and cook for 40 minutes on a low flame. Mix Bisquick and milk together until moist. Drop dumplings into pan (3 tablespoons in size) on top of chicken. Cook uncovered for 10 min. Then cover and cook for 10 more minutes. 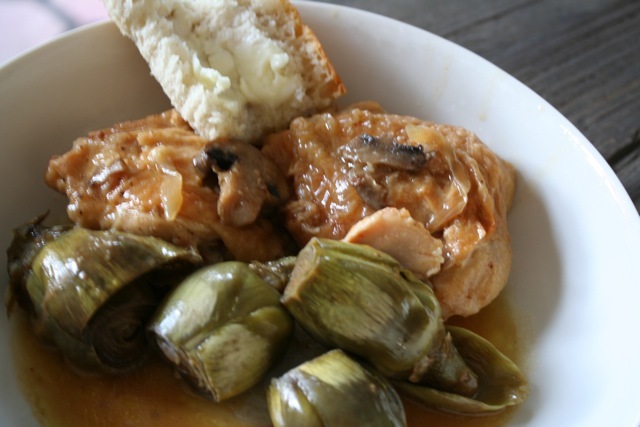 Serve hot with pan gravy covering the chicken and artichokes and/or dumplings. This entry was posted on Friday, February 22nd, 2013 at 4:33 am	and tagged with Baby Artichokes, braised, Chicken, dinner, gravy, mushroom, savory and posted in Category. You can follow any responses to this entry through the RSS 2.0 feed.